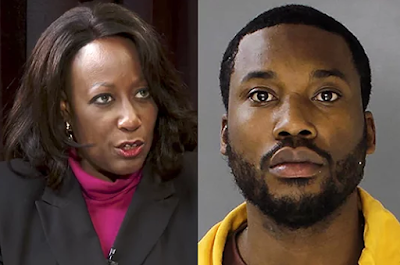 The judge who sentenced Meek Mill to 2 to 4 years in prison for parole violations has been ordered to grant him a bail hearing for the 'harsh' sentencing. The order was given on Monday, after his lawyers appealed to officials at Pennsylvania’s Superior Court, accusing Brinkley of holding up their appeal proceedings by failing to respond to any of their recent motions, while they also lodged an emergency order seeking bail for their famous client. But the Superior Court judges declined to grant Meek’s bail request, explaining the matter should “first be presented to the lower court”, while ordering Judge Brinkley to rule on the outstanding issues "without further delay." “The Court of Common Pleas is directed to enter a disposition of petitioner’s November 16, 2017, motion for bail without further delay,” the Superior Court said. Meanwhile, Judge Brinkley who has been accused of having a vendetta against Mill because the rapper would not give her a shout-out in a song. has been repeatedly criticized, with many claiming that the sentencing was too harsh. It's yet unknown when Judge Brinkley will hold the bail hearing.